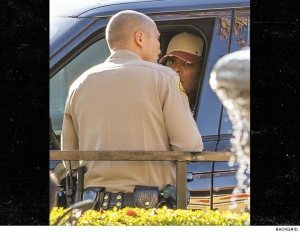 TMZ SPORTS -- Laila Ali was involved in a serious accident in Calabasas that left a pedestrian seriously injured ... TMZ has learned. The accident went down Tuesday afternoon in The Commons at Calabasas. We're told Laila accidentally hit an elderly man while driving through the mall parking lot. Paramedics and L.A. County Sheriff's deputies quickly responded to the scene. Medics treated the victim on the scene, but he was eventually taken by ambulance to a hospital and is in stable condition ... according to our law enforcement sources. Laila remained at the scene and spoke to cops once they arrived. She was not arrested or cited, for now -- and we're told cops are investigating this as an accident.